The signing of a sprawling new trade pact involving two North American countries has revealed a rift in philosophy with the continent’s superpower and raised the question of whether those differences might complicate the NAFTA negotiations. Canada and Mexico joined the new Trans-Pacific Partnership as the three North American countries gathered Tuesday in Montreal for a week-long round seen as potentially pivotal in gauging the prospects for a new NAFTA after a contentious few rounds. The chief negotiators for Canada and Mexico brushed aside the idea that the TPP deal would affect NAFTA talks. “It’s pretty much separate tracks,” Canada’s lead negotiator Steve Verheul told The Canadian Press, while walking between meetings at the negotiating round in Montreal. Some critics bemoaned the timing of a decision to dive into a new Asia-Pacific trade zone, when some of the deal’s basic principles run counter to those of the new, Donald Trump-led U.S. administration. Trump’s team professes to detest multilateral deals; it’s keen to restrict imports from Asia; and it withdrew from the TPP as one of the incoming president’s first acts in office – exactly one year earlier, on Jan. 23, 2017. Fast-forward one year later, Trump was back in the Oval Office making another announcement on trade with Asia. This time he held a signing ceremony to celebrate punitive duties on washing machines and solar panels, and singled out China as his target. He sounded optimistic about NAFTA. Some fear the bonhomie could hit a brick wall. On automobiles in particular, manufacturing jobs are a key Trump priority. The three countries have been hoping to make progress at this round, and Verheul confirmed he intends to suggest ways to help the U.S. meet some of its objectives. But on autos, the TPP runs in the exact opposite direction of Trump’s goals. He wants taller trade barriers, and fewer Asian parts; but TPP liberalizes auto-parts trade, meaning more pieces imported from Asia, including from countries not in the deal – like China. The current NAFTA allows 37.5 per cent of a car to come from outside the trade zone, before tariffs apply. Trump wants that cranked down to 15 per cent – but the new TPP zone moves dramatically in the other direction, to 55 per cent. One auto stakeholder called it inconceivable that Canada would sign a deal that does the opposite of what its No. 1 customer wants. 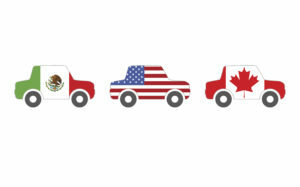 The U.S. buys three-quarters of Canada’s overall exports. And that’s precisely the point, according to defenders of the TPP deal. Pointing to that dependency on the U.S., several defenders said there’s a need for trade diversification. One senior federal source said it even helps Canada’s position at the NAFTA bargaining table, showing the U.S. that it will look elsewhere for partnerships, giving Canada greater leverage. Another potential problem area is dairy: the U.S. wants more access to Canada’s closed market. TPP already opens it up a crack to foreign competition, and defenders of the system say it can’t handle any more liberalization. One Washington-based consultant who knows trade, and the auto sector, offered a nuanced view. Eric Miller said he’s thrilled the deal happened. But he acknowledged it could still create headaches at the NAFTA table. Miller, who worked for the federal government on the 2009 auto bailout, said it will complicate the conversation on auto parts. He predicted this will intensify the American desire for rules that extensively track the origin of pieces. This will raise costs for companies, in terms of compliance and possible fines, he added. And he said U.S. customs officers will have to keep a closer eye out for Asian components in Canadian shipments. That being said, Miller said the TPP deal is great for lumber exporters, livestock producers and many other Canadians and he believes it’s smart for Canada to diversify its trade. Make NAFTA deal this month, or wait until 2019: U.S.